It’s Mirror’s Edge – STALKER. Now that I have your attention, we can proceed. Dying Light is about conservation of energy. Everything you do drains you. Sprinting wears you down slowly, while vaulting from rooftop to rooftop and climbing balconies will wipe you out in seconds. The sense of physicality, and physical limitations, is ever-present. Clubbing an infected human to the ground isn’t so hard in itself, but your character is frequently too exhausted to deliver the coup de grace right away. You stand there, watching your victim struggle back to his feet, waiting for enough strength to return to put him down for good. But at the same time, you’re insanely vulnerable. If a crowd of infected spot you, you won’t have the strength to run. If you whiff on your strike, you’ll be fighting for your life. At rest, with full energy, you are at your strongest. You have nothing but options. You can escape. you can ambush. You can hide. You can attack. But the moment you commit to a course, or get in a chase with an infected, your options get whittled down. By the time you’re exhausted, you need to be in a safe place, or you’re in deep trouble. So much of Dying Light is about surveying the situation and coming up with a plan. What’s the most efficient parkour route? Which infected do you fight, and which do you avoid? Where are you going, and do you have a plan for when you get there? Dying Light is not just a survival game. As a part of a band of survivors, and as one of its scouts and gatherers, you’re usually out wandering the city with a purpose in mind. You don’t need to live constantly on the run, but instead complete missions and report back to your shelter. This makes Dying Light a semi-open world game, in the vein of the original STALKER, which was broken up into a series of sprawling maps to which the player would return again and again. 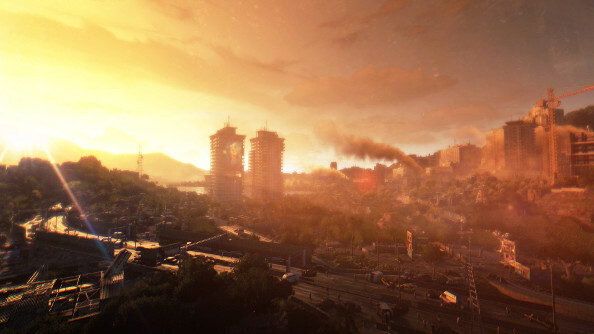 Different quarters of the city appear to play the same role in Dying Light. One day you might be exploring a new area to help activate a communications tower, and the next you might be returning to that area to help another survivor who is in trouble. The city itself is reminiscent of City 17: vaguely eastern European in some places, and in others its sun-drenched stucco suggests the Mediterranean coast. It’s not meant to be any one place in the world. It is always familiar, yet somehow alien. It’s a dangerous place. By day, the city is teeming with infected, who are dangerous in large numbers and surprisingly hard to kill. Most of them aren’t hard to avoid if you just run like hell, but a few of them are feral “runners” and can climb and jump about as well as you. Those bastards will run you to ground and then, since you’re likely spent from the chase, rip you to shreds. There are also a few survivors living among the ruins. Sometimes you’ll encounter them in a fight for their own lives, and have to make a call about whether to intervene or run past. Gangs of organized and armed bandits also roam the city. They’re harder to deal with by yourself… but you can do things like lead swarms of infected to them and strike amidst the ensuing chaos. But the game is called Dying Light for a reason. In the daylight, you have the advantage. You can see, which means you can plan, and most of the enemies you face are manageable threats. But as the sun goes down, the city gets a lot more menacing. More dangerous infected come out. Real monsters, who will hunt you relentlessly if they catch wind of you or spot your flashlight. 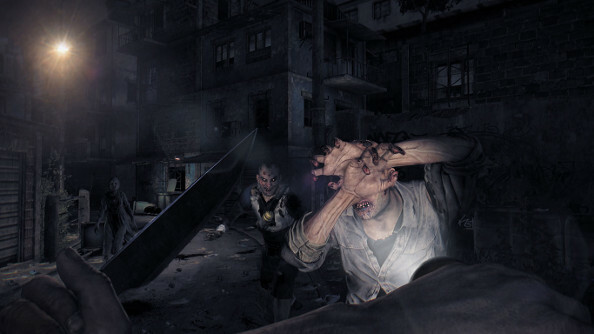 Yet you are effectively blind in the darkness, so Dying Light turns into a terrifyingly stealth game. Overmatched by everything, you have to creep along, raising as little fuss as possible and hoping like hell you don’t stumble into something with sharp teeth and a lousy attitude. Later in the game, of course, you’ll be somewhat more capable in combat thanks to better gear and upgrades. Parkour gets a lot easier as soon as you get a Batman-style grappling hook, but by then the threats will have escalated as well. 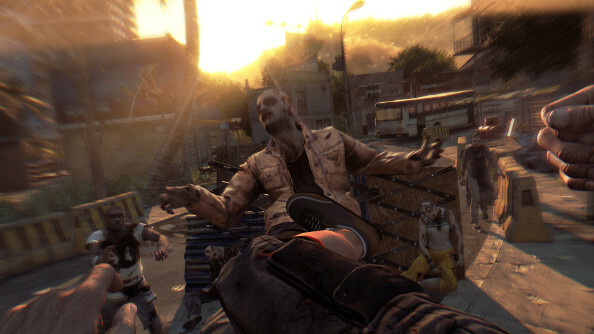 As you might guess, Dying Light seems like it will be a very hard game. That STALKER comparison is not an idle one. Your freedom exists in equal measure to the threats facing you, and there are never enough resources to go around. In fact, it’s so difficult that my E3 demo turned into a frosty standoff between me and one of the developers. To this guy, Dying Light was a parkour game. He wanted me, from the first, just to start flying above the city streets, ducking and diving at all the right moments. This is where the Mirror’s Edge comparison is a bit two-sided. 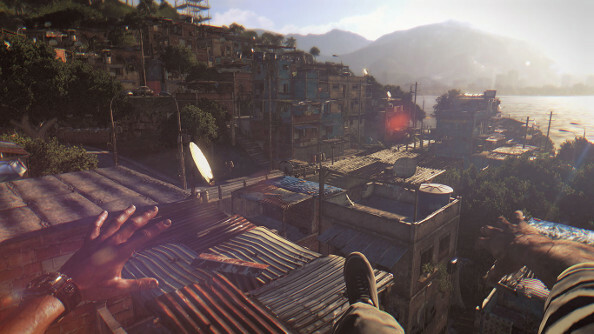 Dying Light, like Mirror’s Edge, feels pretty spectacular when you’re in the zone. A crowd of infected appear in your peripheral vision and then vanish as you vault up onto a balcony, fly up the fire escape, hurdle onto another rooftop, then zip-line to safety a few blocks away. But that’s not the rule. For me, the rule was a “Yakety Sax” series of screw-ups. Turn a corner and stumble into a pack of zombies. Run away, clamber over and abandoned car, then misjudge a jump to a ledge and end up back down in the street. Club a zombie, then start running again… except it’s more of a jog now because my character is completely gassed. Crawl up a ladder. Wheeze on top of a garage. Half-heartedly shove an infected off the roof. Misjudge another jump and dangle for an agonizing second off the edge of another roof before hauling myself up. Stand there not moving until my stamina bar recharges. Repeat. That’s not a bad thing. It means that Dying Light can be a competence power fantasy or an ultra-violent comedy of errors, often with the same five minute span. But it also means that it pays to pause and think about what you want to do here, and the developer watching my play session at E3 was growing increasingly agitated about how I was going about my business. What was a little more worrisome was that a couple of the demo missions required heeding his extremely specific, counterintuitive advice. This is the only thing that left me worried about Dying Light. When you’re left to your own devices, wandering the city and living by your wits, Dying Light seems terrific. The threats are real, but you can use your skills to edge past them. But in some of the more scripted sequences, Dying Light seems to want you to play like an idiot in order to create a horror-movie moment. In a couple places, the solution to a mission was to run right through a pack of monsters letting them give chase so that I could arrive at a safe location IN THE NICK OF TIME. It’s difficult for more systemic games to manage these big narrative moments because they go against the grain of what the player has been taught. I came away from my demo feeling like Dying Light will be better served if it leans heavily on the journey across the city, and less on set-piece encounters near the destination. Honestly, from what I played, the entire game could be me sneaking around a dying city, running in terror and fighting for my life. That foundation, coupled with the delicious dread of sundown, would easily lift Dying Light to cult-hit status when it comes out next year.